Happy National Caesar Day!! A perfect way to start off the long weekend! I love me a good Caesar, especially on a nice sunny day by the Lake 😎! I also love all of these food holidays!! Did you know there is one for every day of the year 😱? I’m not even kidding… there’s a book on it and I’m a little obsessed! Don’t worry, you’ll be seeing a lot of those Holidays on the blog! I’ll be sharing my favourite Sangria recipe next Thursday! You have to let is rest overnight so it will be perfect to enjoy Friday, National Wine Day (Hallelujah 🙏🏻). I might just make this Thirsty Thursday a thing? Yes? OK! 350 Million!! That’s a lot of Caesars! Let me tell you, the Caesar game these days is pretty intense!! Especially with the garnishes, people go wild!! 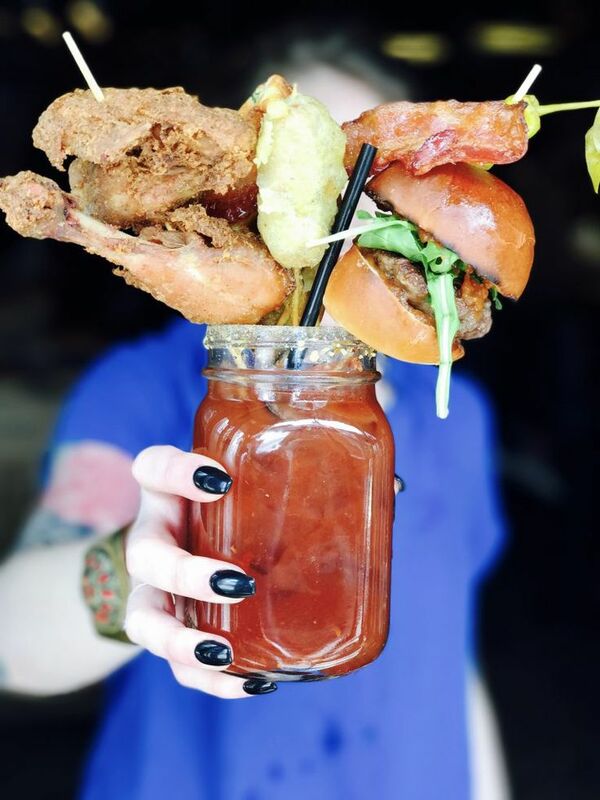 Some Caesar are garnished with a complete meal (go ahead and take a look at that, it’s pretty crazy!). A slider, fried chicken, fried jalapeno, who knows what else is hiding in there! I do love some good garnishes, but I’ll keep my 🍔🍗🍟 on the side please! My current faves are: Crab Legs, Shrimps, Olives, Gherkins and the classic Celery Stalk! I usually also add with a Lemon or Lime wedge, which ever I have on hand! In the summer when I have fresh cherry tomatoes, I like to garnish with little Caprese skewers with mini bocconcini. So good! When it comes to what’s in the actual cocktail, the classic is: Clamato Juice, Vodka, Worcestershire Sauce, Hot Sauce, Salt + Pepper. The glass is usually rimmed in with Lemon or Lime juice, then dipped in Celery salt. There are some really nice Caesar rimmers out there, a mixture of celery salt and other spices! I like this one from Epicure or this one. I’ve also been to some places that rim theirs with Montreal Steak Spice, also delicious! Some people like to add things like pickle juice, pickled jalapeno brine, horseradish, you can really play around with the recipe and figure out which version you like the best! And btw, this also makes a delicious Mocktail, just omit the Vodka! But, for me… like my Classic Lobster Rolls, I usually stick to a Classic Caesar! I hope you all have the chance to enjoy one tonight! Actually, I’m going to put this in the BLD category (Breakfast, Lunch or Dinner). This is pretty much vegetable juice, right? Maybe with an extra little kick 😉! This delicious Caesar is a perfect way to start Brunch, Lunch or Dinner! Clamato Juice, Vodka, Worcestershire Sauce, Hot Sauce, Lemon Juice, Salt + Pepper! How easy is that? Cheers! Squeeze the lemon or lime juice in a shallow dish. Dip the rim of you glass in the lemon juice, then dip in the spices. Add ice to to your glass. Pour the vodka, Worcestershire sauce, tabasco, lemon juice over ice. Sprinkle of salt and freshly cracked black pepper. Add Clamato juice, stir to combine and serve immediately. *Like i mentioned in my blog post, some people like to add the brine of the pickled garnishes. If you want to try it, I would start with 1 Tsp at a time and adjust to taste. Same goes for the fresh or prepared horseradish, add about a tsp and go from there! **This would also make a delicious Mocktail, just omit the vodka! Wow! It’s a work of art.